We are proud to announce our signing of a partnership agreement that will see Hadef and Partners support the Special Olympics World Games as the official legal supporter and provide legal advisory services through the build-up to, during and after the World Games. The Games, which will take place for the first time in the Middle East, will run across the Emirate in venues within both Abu Dhabi and Dubai from the 14-21 March 2019. The event will be under the patronage of His Highness Sheikh Mohamed bin Zayed Al Nahyan and will be the largest sports and humanitarian event this year. Hadef & Partners will provide legal support from their offices in both Abu Dhabi and Dubai and will call upon the full service experience of almost 100 lawyers from the UAE, Middle East and the international arena. 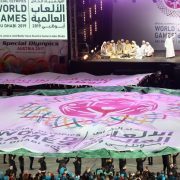 For more information on the Special Olympics World Games Abu Dhabi 2019, please visit https://www.abudhabi2019.org/.